Returning to the states in the early 1970s, Jordan went back to school at the Military College of South Carolina. He studied the sciences and following the gaining of his degree started work as a nuclear engineer for the Navy. Jordan had many other concepts waiting to be written in the fantasy genre, he was waiting to start them once he finished The Wheel of Time. However, fate was not kind to him. In March of 2006, he announced publicly that he had cardiac amyloids, a rare blood disease. He was given four years to live. He underwent chemotherapy and took part in a study for a new drug that might have helped him. It was all to no avail. Jordan passed away in September of 2007 with his Wheel of Time series unfinished. After his death, his wife selected Brandon Sanderson, an up and coming epic fantasy author, to complete the Wheel of Time series based on the notes that her husband had left behind. Robert Jordan had written the epilogue and a few chapters, but little more of the final book. Sanderson took up the challenge but found that the story was so complex that he needed three rather long books to finish the Wheel of Time properly. The Eye of the World is the first book of a long fantasy epic series that features a cast of main characters instead of a single hero. It has a huge cast of characters and the story unfolds, chapter by chapter, via the viewpoint of a different rotating protagonist. It is a complex tale with many twists and turns. The story begins in a land known as the Two Rivers which has been all but cut off from the rest of the world for at least a thousand years. It is a rural place of small villages and isolated farms. During the spring festival, young Rand al’Thor notices a stranger watching him. A man whose cloak doesn’t move in the wind. He tells his father about the stranger, but he is gone when his father looks. They arrive in the village of Emond’s Field for the festival and Rand hooks up with his two friends. Perrin, the apprentice to the village blacksmith and Mat, a comedic prankster. They both mention that they have seen this same stranger watching them. In the village, there are visitors come for the festival. Aes Sedai Moiraine and her warder protector Lan. Moiraine gives each of the three boys a coin; she calls it a token for future work she may ask of them. Rand and his father return home, but are attacked by creatures known as “Trollocs”. Rand’s father is wounded during the attack. In his delirium, he tells his son that he is adopted, a foundling he picked up on a mountaintop during the Aiel War. Rand takes his injured father back to the village in the hope that the Aes Sedai can use her magic to heal his father. She does heal his father, but she tells Rand, Mat, and Perrin that the Trollocs are after them personally. The strange man who watches them is a “Myrddraal”, a creature of darkness, and the three must leave the village for their own safety and that of their people. The three decide to leave with Moiraine and her Warder. At the last minute, Rand’s girlfriend Egwene joins them. She desires to become an Aes Sedai herself and this is a good excuses to leave Edmond’s Field. A wandering minstrel named Thom also comes along. The party flees Emond’s Field and travel toward the town of Baerlon. There they meet a young woman named Min who claims that she can see auras around Rand and his friends. While there, their village wisdom Nynaeve find them and says that she wishes to bring the boys home for their own good. This causes her to be at odds with the Aes Sedai who is having enough trouble protecting the boys from Trolloc attacks on the road. In Baerlon, the boys begin to have dreams where a man clad in black names himself Ba’alzamon and tells them that they will serve him and the Dark One. Moiraine wishes to bring the boys to the city of Aes Sedai, known as Tar Valon, where they can be better protected. She uses her channeling magic, called The One Power, to scare off whitecloak soldiers in Baerlon who wish to harm the boys. While their inn is set on fire, the party escapes. Away from Baerlon, the group is forced to seek refuge from the Trollocs in an abandoned city called Shadar Logoth. Even the Trollocs fear to enter the city. In the city, the boys go exploring and meet a man called Mordeth who casts no shadow. Mat steals a dagger from him. The boys manage to get away from the man, but this episode worries the Aes Sedai and her Warder enough that they decide to split the party up. Perrin and Egwene cross the river and try to make their way to Tar Valon on their own. On the way they encounter a man who can talk to wolves. He claims that Perrin has this ability too. As they continue to travel, Perrin and Egwene come to a “stedding”, which is the home of “Ogiers”, giant sized people who live incredibly long lives. Their home has magical protection from Trollocs, however Perrin and Egwene discover that Whitecloaks have also come. The Whitecloaks take a disliking to Perrin due to his association with wolves, which they regard as evil. Nynaeve, Lan and Moiraine depart Shadar Logoth together. Moiraine senses that Nynaeve also has the one power and can channel it, but she is untrained. Without the schooling of the Aes Sedai of Tar Valon, she may die. Nynaeve resists the idea, but in the end she accepts that she will need to become an Aes Sedai and agrees to go to Tar Valon with Moiraine. Nynaeve casts her eye on the intrepid Lan and the two begin to fall for each other, which causes complications for Moiraine who is bonded to the man via the one power. Via the coin Moiraine had given Perrin in Emond’s Field, the Aes Sedai is able to track him and Egwene. The trio arrives to save the pair in the nick of time from the Whitecloaks. Mat, Thom and Rand leave Shadar Logoth in a boat and eventually arrive in the city of Caemlyn. Mat becomes increasing paranoid on the journey. Unknown to the boys, he is being magically poisoned by the dagger he stole from Mordeth in Shadar Logoth. In the city, Rand meets a young Ogier named Loial, who at first mistakes him for an Aiel and tells Rand that he must be a “ta’veren”, a man who fate wraps itself around. Rand is eventually taken to see Queen Morgase where a seer has a foretelling that Rand is at the center of all the destruction that is to come to Caemlyn. While it is commented that Rand looks like an Aielman, his accent is that of the Two Rivers. The Queen decides that Rand may go free since she is familiar with the people of the Two Rivers. Moiraine and her party arrive in Caemlyn and connect with Rand and Mat. Moiraine uses the one power to heal Mat of the poison from the dagger. The group learns that the Dark One plans to use an object known as The Eye of the World in a place called the Blight. Loial the Ogier knows how to use a magical passage called “the ways” and takes the group to the Blight via this method. There Rand must confront Ba’alzamon, using the budding power within him, to claim the objects that are contained in the Eye of the World. I was first introduced to The Wheel of Time saga by gaming friends that were hooked on the roleplaying game based on the novels. In order to play the game, it was necessary to read the books. It did not take me long in The Eye of the World to become completely hooked on this series and soon would go on to read the rest of the novels. 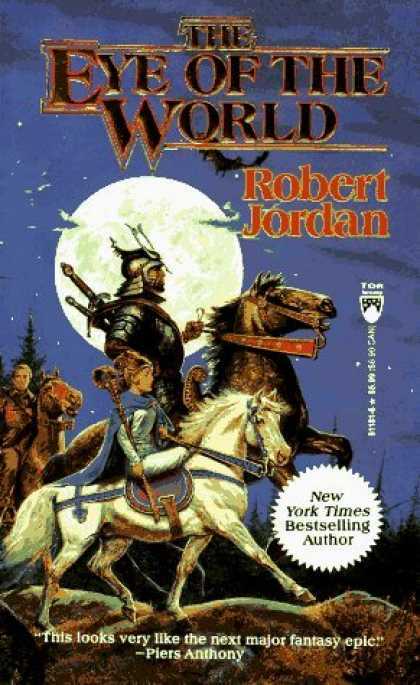 I had an opportunity to hear Robert Jordan read from his final work-in-progress novel, the one that would eventually turn into three volumes written by Brandon Sanderson, at the San Diego Comic Con a few months before his death. The room was packed with hundreds of breathless people, waiting to hear Jordan read from his much anticipated book. He was seated and did not wish to move about much due to his illness, but his voice was strong and clear. The words captivated the audience. When he died with the final book unfinished, I was one of those heart-broken fans that wondered if I would ever hear the end of the tale by one of my favorite authors. When his wife commissioned Brandon Sanderson to finish the series, I was uncertain if this young author had the chops to write The Wheel of Time. I checked out one of his first novels, Elantris, and saw the quality of his work. I had nothing to worry about. Sanderson has gone on to become one of the top writers in the epic fantasy genre today. Lord of Chaos	(1994)	Locus Award nominee, 1995. Knife of Dreams	(2005)	Final novel completed by Robert Jordan. The Gathering Storm	(2009)	Completed by Brandon Sanderson. Towers of Midnight	(2010)	Completed by Brandon Sanderson. A Memory of Light	(2013)	Completed by Brandon Sanderson, epilogue by Robert Jordan.